Thursday night's game between No. 25 ASU and No. 17 UA at Wells Fargo Arena is shaping up to be the most expensive Sun Devil home basketball game since at least 2012, and possibly ever. As of Wednesday, the average ticket price for the game on reseller site VividSeats.com is $108. That's a full $22 more than the previous average high for an ASU home game on that site. 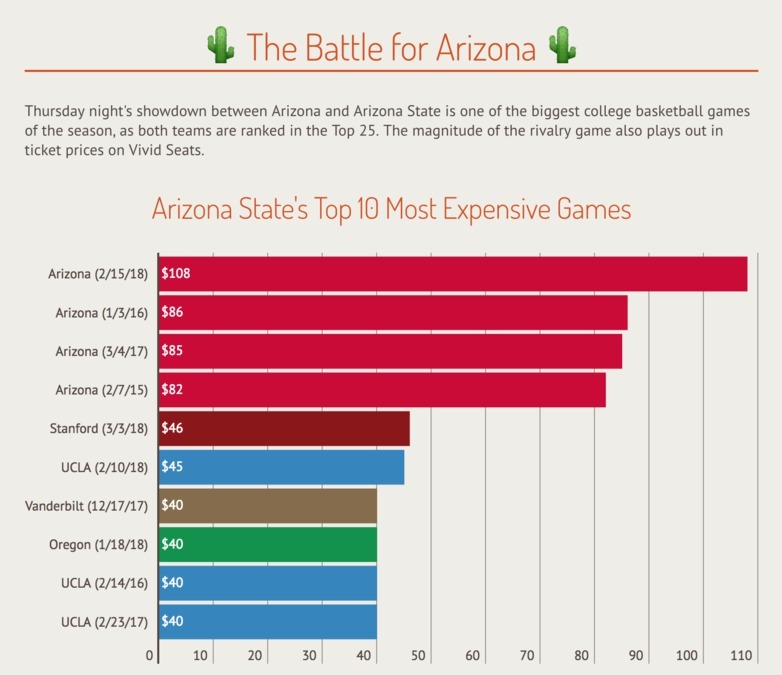 Each of ASU's three previous most expensive games also came against the Wildcats. In fact, as of Wednesday, the least expensive ticket for Thursday's basketball game on VividSeats.com is $10 more than the least expensive ticket for November's ASU-UA football game in Tucson. The Sun Devils have enjoyed a massive home attendance spike this season after getting off to a 12-0 start, their best in program history, and climbing as high as No. 3 in the Associated Press poll. Thursday's game has been sold out for several weeks, but plenty of tickets remain on resale sites. Thursday's game will be a rematch of the Dec. 30 matchup between the Sun Devils and Wildcats in Tucson. That game had an average ticket price of $135, making it the most expensive at McKale Center so far this season. UA won that game 84-78 to hand ASU its first loss of the season. Thursday's game will begin at 7 p.m. and will be broadcast nationally on ESPN.